In the previous post we managed to catch the scan codes of keys pressed on a USB keyboard. In this post we will be redirecting these keystrokes to our C64 module so we can have some meaningful interaction with our C64 module. Let us start by refreshing our minds a bit. A couple of posts ago we implemented two slave registers which we mapped into memory space at locations 43c0_0000 and 43c0_0004. 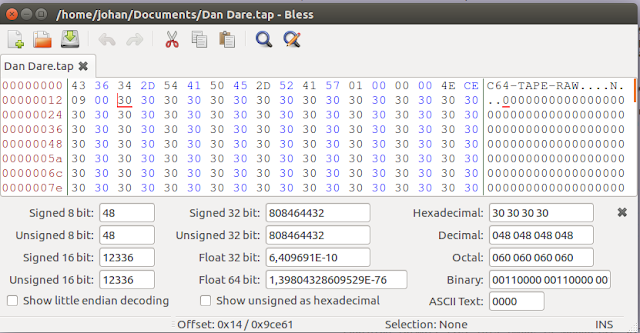 Combining these two slave registers we have 64 bits in which each of these bits represents a key on the C64 keyboards. The ARM can toggle the bits in these registers and in effect simulate key presses within our C64 module. All it will take from us is to take the USB keyboard scan codes we receive from the keyboard, and converting it to C64 key scan codes and we have a working implementation. Let us start by implementing a mapping between USB and C64 keyboard for just four keys: A, B, C, D.
Here we set the corresponding bit in the slave register according to the returned c64 scan code. Our mapUsbToC64 can now just be extended to cover the other keys. So, if the scancode is less than 32 we set the appropriate bit at address 0x43c0_0000. For scancodes bigger than 32 we set the appropriate bit at address 0x43c0_0004. Up to this point in time we are only able to deal with one key press at a time. This becomes an issue when we want to type double quotes (") on the C64, which require pressing the shift and the 2 key simultaneously. In this section we will deal with simultaneous key presses. Luckily from the USB side we are provided with enough information to determine if more than one key is pressed simultaneously. Each byte from the 8 bytes returned in the USB report descriptor represent a key that is currently been pressed. The exception to the rule is modifier keys, like Shift and Control. The status of all the modifier keys is contained within a single byte, where is bit corresponds to a modifier key. You will see that for the first USB word we are discarding the first two bytes. This is because the first byte is the byte mask for the modifier keys and the second byte is reserved. In the USB report the left shift key is bit 2 of the modifier byte. So this is why we are masking off this bit. In this post we integrated the USB keyboard with our C64 module. We then tested everything by writing a very simple basic program and running it. In the previous post we managed to read a couple of descriptors from a USB keyboard and identified which endpoint to use for capturing the keystrokes from the keyboard. In this post we will develop some code for actually retrieving the keystrokes from the keyboard. As you can see, after the Default state there is still two states, Address and Configured, we need to go through until we can do something useful with the USB device. Let us start by having a look at the Address state. In this state we assign an address to our USB device so so that it stops listening at the default address (e.g. 0). Here we are setting up a request type 5, which is SET_ADDRESS, and we are setting the device to address 3. We end by waiting 3 milliseconds just make sure everything settled down before we continue. You will see that we adjust the device address in our first address to 3, because the address was changed in a previous state. Next we select the appropriate configuration. In the previous post we determined that we should select configuration number #1. At this stage our USB device is fully configured and ready to use. With our USB keyboard ready to use, the next thing obviously for us is to read the keystrokes. My first take on reading these keystrokes was to also implement an asynchronous schedule. However, with this approach I didn't had any luck at all. Things worked better for me using Periodic schedules. So, in this section let us spend some time discussing in more detail how periodic schedules work. From the diagram we see that everything is driven of a periodic frame list been referenced in part by a FrameIndex, which is updated at the end of each USB frame. A USB Frame is basically a time period of 1 millisecond. If you look into further detail on when the FrameIndex gets updated, you will see that strictly speaking the frameindex isn't updated every millisecond, but every 1/8 millisecond. Furthermore you will see that the bottom 3 bits of the FrameIndex is not used to index the Periodic frame list, but rather from bit 3 upwards of the frameindex. At this point you my be wondering why the frameindex get incremented every 1/8 of a millsecond if the rest of the system only work in increments of 1 millisecond. The answer is to maintain a bit of compatibility between USB 1.1 and USB 2.0. USB 1.1 always had frames of 1 millisecond in duration. USB 2.0 introduced the concept of microframes, breaking a framedown into even smaller durations of 1/8 milliseconds. But, despite my explanation, how can you access 1/8 millisecond frames if the frame index, for all basic reasons, only gets incremented every 1 milliseconds? The key to this questions lies in the lower 8 bits of word 2 in a QH. From the EHCI spec these 8 bits is referred to as the Interrupt schedule mask. Every bit in this byte correspond to a specific microframe within the frame. A one in any particular position means that the transaction will take place within the particular microframe. If only one bit is set within the Interrupts schedule mask, only one transaction will execute within the frame. Similarly, if more than one bit is set, more than one transaction will trigger within the frame. Let us now talk a bit about the data structures a Period Frame List points to. 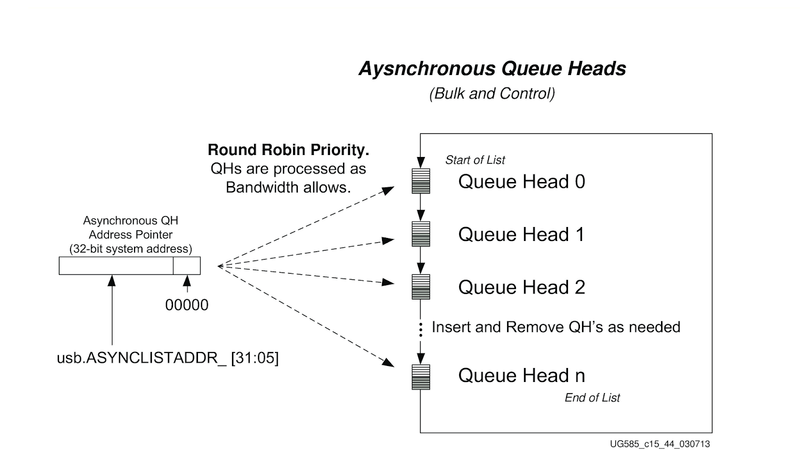 A Periodic Frame List also points to QH/qtd structures as an Asynchronous List does. In fact, it is very convenient to think of each element in a Periodic Frame List as an Asynchronous list on its own. In this analogy, each element of the Periodic Frame List can be thought of as an ASYNCLISTADDR-register on its own. There is , however, a small flaw in this analogy. In an Asynchronous schedule the ASYNCLISTADDR-register gets updated during traversal to always point to the next QH in the list. In a periodic schedule, however, each element in the Periodic Frame List always point to the first QH element in the list. As such, within a periodic schedule a circular QH list doesn't make sense. Let us now write some code for scheduling the periodic schedule. Firstly we need to specify the number of elements of our Periodic Frame List. We want to poll once every 16 milliseconds. Since each element have duration of 1 millisecond, it makes sense to have sixteen elements with only one of these elements pointing to a valid QH. You might find it a bit strange that we start with a QH that doesn't contain any qTD's at all, followed by a QH that does have them. I will explain the reasoning behind this a bit later on. You will also see that the NAK count reload field for the second QH is zero. You might recall that for our asynchronous Schedule this was always 15. Why the difference? To answer this question let us first look at what a NAK packet is. When a USB host request data from a USB device and the device doesn't have any data available it will respond with a NAK packet. Sometimes you would like to throw an error if a certain number of NAK packets is received in a row. This is the purpose of the NAK reload field. In our case we just would like to ignore these packets all together, so we set the RL field to zero. In our schedule when a NAK packet is encountered the slot will just be ignored and be moved on to the next slot. As can be seen, we schedule a wait of 10 milliseconds before we transition the next state. Let us now write some code for capturing keystrokes from the USB keyboard. The basic idea is to display the keycode each time a key is pressed or released. In the previous post we have set up the periodic scheduled with a scheduled qTD transfer in one slot. We are polling the qTD datastructure at every 10 milliseconds. Once transfer is finished we will get the keystroke information at the first eight bytes at location 0x305000. Once the scheduled transfer is finished, a new transfer would not be automatically scheduled. It is up to you to schedule a new one. Changes you made to QH and qTD structures are written to System Memory. The DMA block within the USB controller reads these reads these changes from Main Memory from time to time into internal Dual-Port RAM. One cannot tell at which stage the USB Controller is reading from System memory and half baked qTD datastructures might end up into the Dual port RAM. As you see, this is where our QH comes in which contains no qTD's. Once we have created a new QH and qTD we just change the next pointer of the first mentioned QH. All the developed code should now be sufficient to capturing the keystrokes continuously and outputting to the console. As mentioned in the previous section, each key press will result in 8 bytes been populated at address 0x305000. However only the last 6 bytes is significant to us. Each value of these six bytes represent a keycode of a key that is currently pressed. This means that up to 6 keys can be pressed simultaneously. In this post we implemented some code for catching keystrokes from the USB keyboard. In the next post we will integrate the USB keyboard with our C64 module. 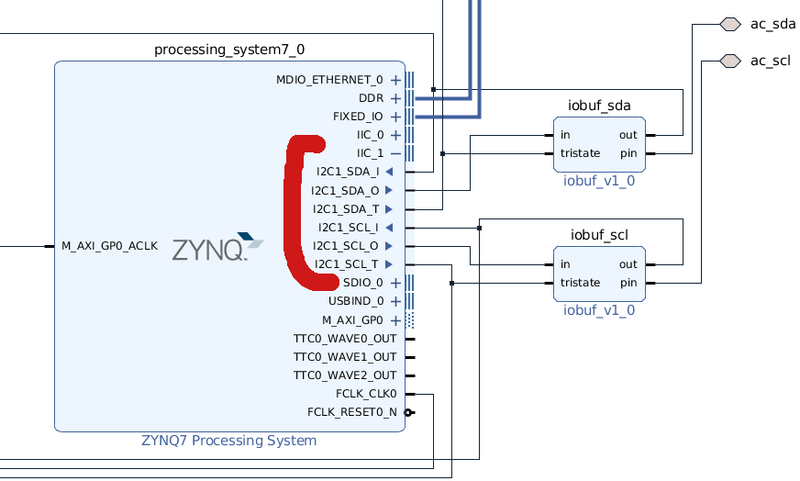 In the previous post we discussed a bit of theory surrounding USB communications and started to implement some interrupts from the USB functional block in the Zynq. In this post we will get a bit more practical and see how to reset a USB device and to read configuration information from it. In this post we will not be implementing functionality to detect when a device is plugged or unplugged, in order to keep things simple. We will thus assume a USB keyboard is attached on the USB port when we start up. The attached state is the state when you have just attached a USB device into the USB port. Provided the USB host enabled a voltage between the VCC pin and GND pin on the USB port, the USB port will power up and enter the Powered state shortly after attachment. It should be noted, though, that when a USB Host was just powered up, no voltage will be present on the VCC+GND pins. It is up to you to configure the USB Hub so that power is enabled over these two pins. Once a USB is in the powered state, it still will not respond to any Host commands over the ports. You first need to apply a reset over the USB port so that the device enter the Default state. When a USB device is in the default state, it will respond to traffic on device address 0 and on endpoint 0. It should be noted that the USB device will not stay in the default state for long, probably for a couple of tens of milliseconds, at most. It is up to you to get the device to the address state as soon as possible. At the addressed state the USB will be assigned a non zero-address and all subsequent communication will be directly to this new address. For the USB device to become fully functional it needs to transition to the configured state. For the purpose of this post, we will just be moving to the default state and requesting a device descriptor and requesting a configuration descriptor. More on these descriptors later on. Let us get to writing some code. A you might remember from the previous post, we are using the state_machine method as a callback when an interrupt happens within the USB block of the Zynq. Here, however we are also calling it from the main method. We do this just as the initial state for our state machine. In this initial state we assert the port reset and schedule the timer for 12ms. After the 12ms an interrupts will trigger and the state_machine method will be called again. This time around we will de-assert the port reset. At this stage our USB keyboard should be in the default state listening for USB traffic on address 0. It is in this default state we can read the device descriptor and the configuration descriptor from the USB device. Let us have a look at the QH and qTD data structures. The first word in the structure is a pointer to the next QH. For our Asynchronous schedule, the first QH will just be pointing to itself. C (Control endpoint flag). Set this field to a one if it is a non High Speed, control endpoint. We will indeed set this field to one in our case. Maximum Packet length: We will be setting this field to 8. For the third word, I will not going into detail. We will just be using the value 0x40000000. You will see that the remaining words is coloured in grey and according to the legend this means Host Controller Read/Write. We will leave all these zero, accept for Next qTD Pointer, in which we will specify the first qTD. The first word is a pointer to the next qTD structure. Buffer Pointers 0 to 4: Four pointers, each of whicg points to a 4KB buffer. This contains the data received from or to send to the USB device that is assoaiated with this transfer descriptor. One of the data-structures we covered in the previous section was transfer descriptors. A Transfer descriptor is what its name implies, that is to transfer data to or from the USB device. This web page basically states that a Control Transfer can be broken down into a couple stages. To narrow down the number of scenarios, I am just going to focus on one particular use case: Getting a device descriptor from the USB device via the Control endpoint. 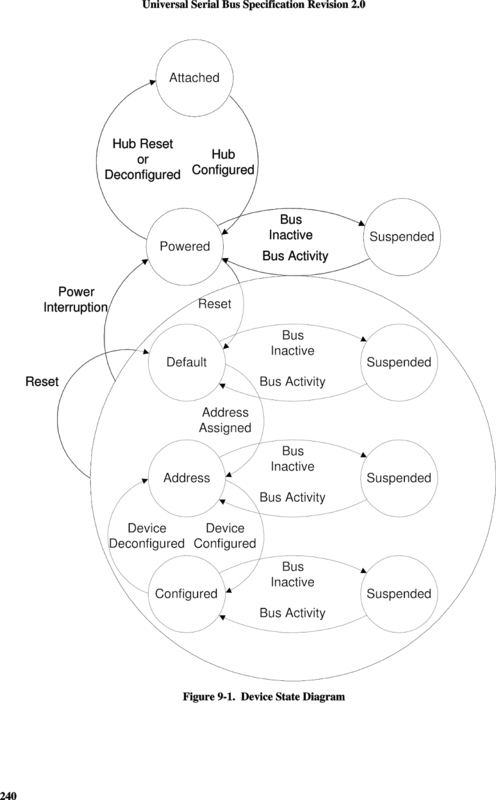 With this use case in mind, let us have a look at the different stages for a Control transfer. The setup stage starts by issuing a setup token to the USB device. This indicates to the USB device what kind of data is about to follow. Next follows a data packet. 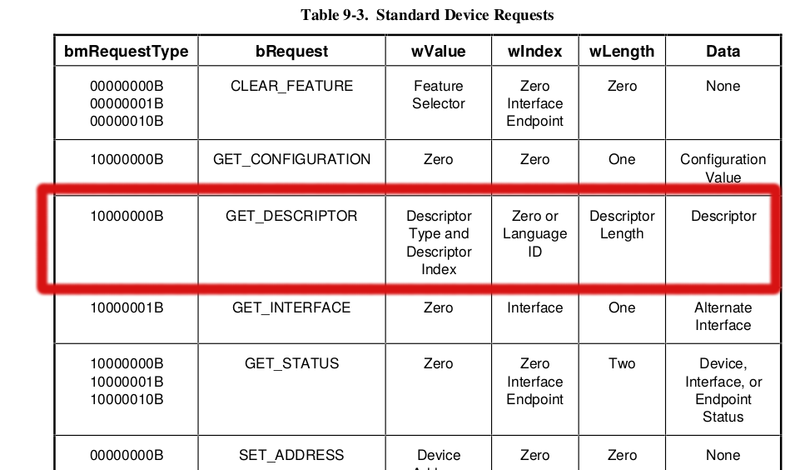 In our use case where want to request a device descriptor, this packet would contain this request to the USB device as such. The USB would acknowledge the whole request with a ACK packet, indiacted by the white block in the diagram. This whole stage would be taken care of by a transfer descriptor as discussed in the previous section. Interestingly, for this stage a PID would specified. The data packet for this request would be contained in a buffer pointed to buffer pointer 0 contained in word 3 of the relevant qTD. This diagram from Beyondlogic outlines two scenarios. The first scenario is when we expect data back from the USB device and the second scenario is is we are required to send data to the USB device after the setup phase. For our Use case we are only interested in the first scenario. For this we need need to setup a qTD with a PID of one. The Buffer pointer in this qTD will be a pointer to the buffer that will receive the data from the USB device during the Data Packet Phase. Don't worry about the Handshake packet for now. This will be covered in the next phase. For this stage we need to create a qTD with a PID of zero. Since we will be sending a data packet of zero length, we don't need to specify a valid buffer pointer in this qTD. Now with a bit of theory behind, let us write some again. This time we will initialise the async queue. Since our application is a bare-metal application, we will not be making use of malloc calls to allocate memory for our data structures. Instead, we will use some specific memory locations for our data-structures. This will clear 1 Million bytes worth of words to zero starting at address 0x300000. This QH starts at memory location 0x300000. The next pointer points back to itself (e.g. the first word). You will also release that this pointer ends with 2 instead of zero. This is because bit 1 and 2 actually represents the head type of the pointer, which in this case is a QH. Word 4 is a pointer to the first qTD of this QH, which starts at address 0x300040. Word one has the value 1, menaing there is not a valid next qTD. The async schedule is started by setting bit 5 of register 0xe0002140. Once enabled, the scheduler looks at register 0xe0002158 as the location for the first QH. As mentioned, this async is now in the halt state. We need to add additional qTD's to make this schedule do something useful. We will cover this in the next section. Int he previous section we managed to enable an async, although not a very useful one: everything is in the halted state! Setup specify whether we should add a setup qTD. Direction specify whether we want to receive or send data. For receiving direction should be a 1. Size is the number of bytes we want to send or receive. qh_add is the address of the QH at which we want to add the qTD's. You will see that the lower eight bits of word2 is still 0x40. This means that our queue will remain in the halt state till we change it another value. The last qTD is again a halt qTD. This code is also written as such so that the last qtd executed creates an interrupt. This method advances to the next address and return to 0x300040 after a couple of advances, in effect simulating a circular buffer. With the method created in the previous section, we can now use it to read a descriptor from the USB device. Let us have a look at the values. We start with bmRequestType with value 0x80. For bmRequest we need to use the constant GET_DESCRIPTOR. To get this value scroll down to the next page of the USB 2.0 spec and you will see the value is 6. Descriptor Type is retrieved from the next table and have value 1 for Descriptor type DEVICE. As seen, we are writing the request to the buffer at address 0x301000. Since bytes are stored with an ARM core is little endian, for each word you should read the bytes from right to left. So, we start off with 0x12 which is the length of the Descriptor. 0x1 is the Descriptor typem which in this case is DEVICE. The next two bytes indicates the USB version which in this case is 1.1. The next couple of bytes gives information of the Device class which is zero for three bytes. This means more info about the device is provided in the Configuration descriptor. Following that is the maximum packet size which is 8 bytes. Then there is a couple of vendor, product versions. The last number of the descriptor is a 1 meaning that there is only one possible configuration. That concludes our discussion on getting and reading the DEVICE descriptor. Let us discuss these descriptors. From the configuration descriptor we see that two interfaces are defined. Each interface has the descriptor type number 4. Further more, byte 5 of this interface descriptor specify the interface type. For both these interfaces this is type 3, which is an HID(Human interface device). The next two bytes of interest of the Interface descriptors is byte 6 and 7. For the first interface descriptor these bytes are 1 and 1, whereas for the second one it is 0 and 0. This type of Interface is a simplified keyboard interface for BIOS's and we will indeed use this Interface for our design. Let us now go and have a look at the endpoint for this Interface. 0x81 specify that this is an IN endpoint and the address of this endpoint is 1. The 3 specifies that this in an interrupt endpoint. The 8 specifies that the maximum packet size for this endpoint is 8 bytes. The 0x0A specify the polling interval in milliseconds. Thus in this case the polling interval is 10 milliseconds. In this post we managed to read a couple of descriptors from a USB keyboard and isolated an endpoint that we can use to read keystrokes from the keyboard. In the next post we will attempt to read keystrokes from the USB keyboard. In the previous post we managed to implement the flashing cursor and keyboard interaction. At this point in time a keypress can only be simulated by running a program on the ARM core that writes a value to a specific register and we are not yet at a point of integrating a physical keyboard to our C64 system. The goal I have in mind is to integrate with a USB keyboard. To do this there is an easy way and a difficult way. The easy way is way is to make use of PetaLinux, a Linux distribution provided by Xilinx for the Zynq processor. Going this route will give you some USB and keyboard drivers simplifying our integration with a USB keyboard, avoiding to worry about the technicalities of the USB protocol. Then there is the difficult route, trying to access the USB keyboard in Standalone mode. In standalone mode you cannot make use of the drivers that comes bundled with Linux, and you sort of need to re-invent the wheel for USB keyboard interaction. Re-inventing the wheel is not really cool, but it gave me some second thoughts. I have been using USB devices for almost 18 years without knowing how the communication work between the PC and a USB device. Going the difficult route is actually an opportunity to learn how USB works and in the next couple of posts (two or three?) we are going to do just that. We are going to start off with a bit of theory on USB protocols and will gradually work our way to a practical implementation. I am not going to implement a full USB protocol stack, but just bear minimum that is necessary to catch keystrokes from a USB keyboard. I have received a couple of requests to publish the full source code for the project in its current state. Within the Readme.md I am going some instructions on how to create the project files and building the project. A USB can support one or more functions shown by the blue blocks above. Let us have a quick look at an example where a USB device can support more than one function. Say, for example, a manufacturer brings out a USB-webcam. The manufacturer might also decide to also ship the device drivers on the web cam itself and surface it to your PC as a Mass Storage Device. Cool solution, but how will your PC differentiate between these two functionalities on the same set of USB wires? The answer is to give each functionality an endpoint number. When your PC communicates with the USB device, it always need to provide an endpoint number so that the USB device knows for which function the message is intended for. Let us now move onto the topic on how USB devices are addressed. USB devices are connected to the PC in a star topology. Star topology is the same topology used on a Commodore 64 to attach multiple drives and printers to the single serial port on the C64. A quirk with the star topology is that all devices can see all traffic of each other. To avoid confusion a unique address needs to be assigned to each device. On C64 disk drives you make use of jumpers on each drive to assign the address. On USB devices you don't have jumpers. So, how are the addresses assigned? The answer is that you just need to reset a device, then it will be in the default address state and respond on requests on Address zero. Yes it is, but a USB reset signal is one of the signals a USB host has finer control of, and you can limit a reset to a specific to a specific USB port. Let us conclude our Overview of USB by having a look at how communication is orchestrated between the devices and the Host. 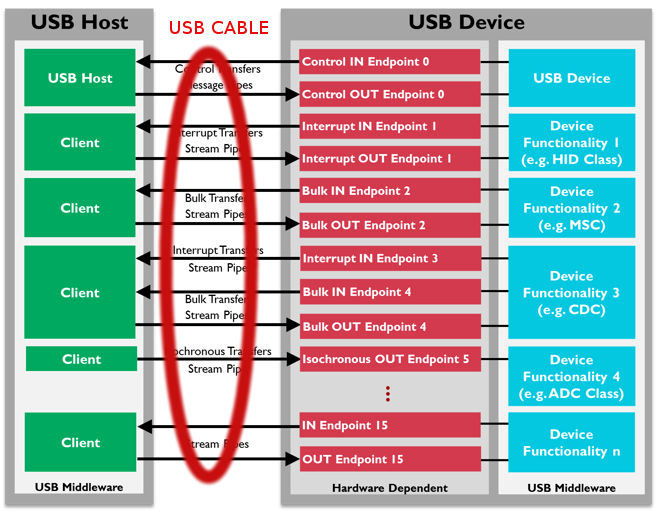 USB communication among the devices and the host is orchestrated by means of Host polling. This means that the host initiates all communication. Even if a USB device have some information that urgently needs the attention of the host it needs to wait for the host to ask it for the information. Back to the ZYBO board. 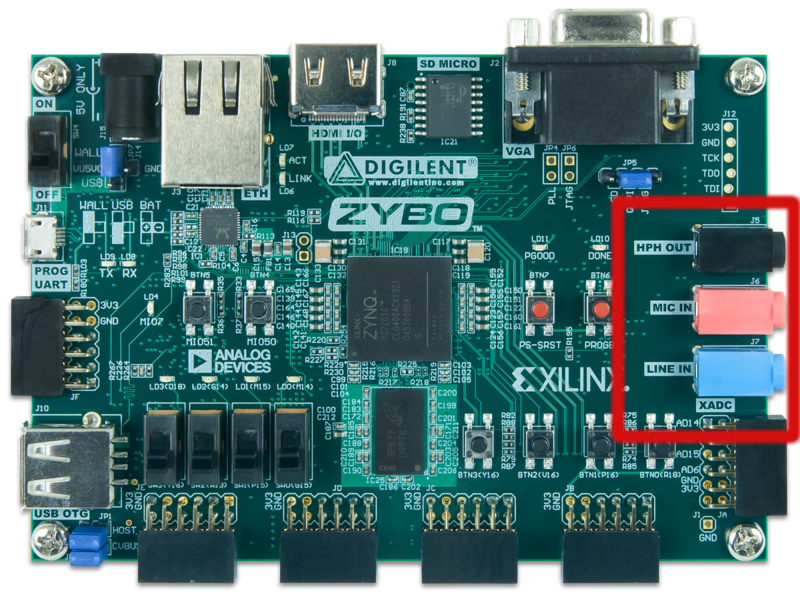 If you have a look in the ZYNQ 7000 manual, you will see that it provide some information on how to establish communication between your Zybo board and a USB device. However, when working on your USB implementation, you will probably find that the information provided within this Technical Reference manual is simply not enough to give you a clear direction on where to go. Doing an Internet search on how to implement USB on the Zybo board will probably also not be fruitful either. 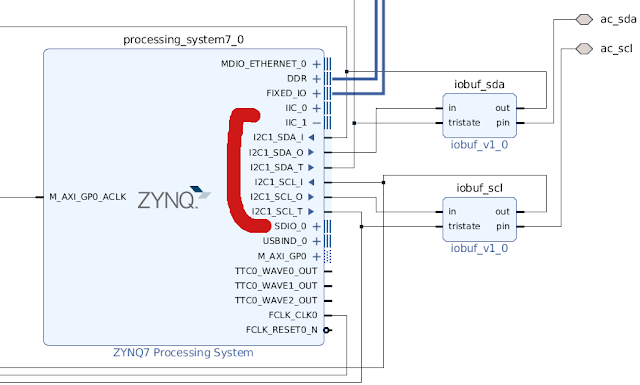 I almost went into despair over this, till I found that the USB specific registers on the Zynq is not specific to the Zynq only, but follows a specific standard known as ECHI (Enhanced Host Controller Interface). The thought that the USB implementation was not Zynq specific, actually widened my horizon and immediately was able to find more implementation examples. In fact, I could find a nice example within the Linux source tree. To communicate with USB devices, the EHCI standard defines two schedules into which you can queue USB communication requests: Periodic schedule & Asynchronous schedule. We will cover in more detail how this schedule is setup at a later stage. The interesting part in the diagram is where it mentions Insert and Remove QH's as needed, just reiterating its adhoc nature. When you are at a point of not needing any information from the Async Queue at the moment, you will just have a Queue Head pointing to itself been in one or other Halt state. When you suddenly need some information again from a particular USB device, you can add a Queue head to the Queue, which will be processed and the Queue will return back to a halt state. We will cover setup of the Asynchronous queue also at a later stage. We have covered quite of theory. Let us now see if we can start writing some code. Programming a USB interface have quite some detail, and one can a bit overwhelmed so that you don't know where to start. But, we can always start with small steps. Starting with getting the Caching right. In order to set up a periodic queue or an async queue, you need to write some data structures directly to SDRAM. When an ARM core writes these structures, the data-structures might not end up in SDRAM straight away, but will linger for some time in an L1 or an L2 datacache. I have added so long most of the common headers we will need over time for our USB exercise. The headers together with the associated libraries is provided by the Xilinx SDK when you compile your program as a standalone. Let us us now move onto interrupts. The USB module present within the Zynq provides interrupts for two timer expiry events, and USB events like when transfers is completed. These are very useful interrupts indeed which we would like to intercept. It is therefore necessary to enable the above mentioned interrupts and ensure one of our custom methods gets called when they happen. 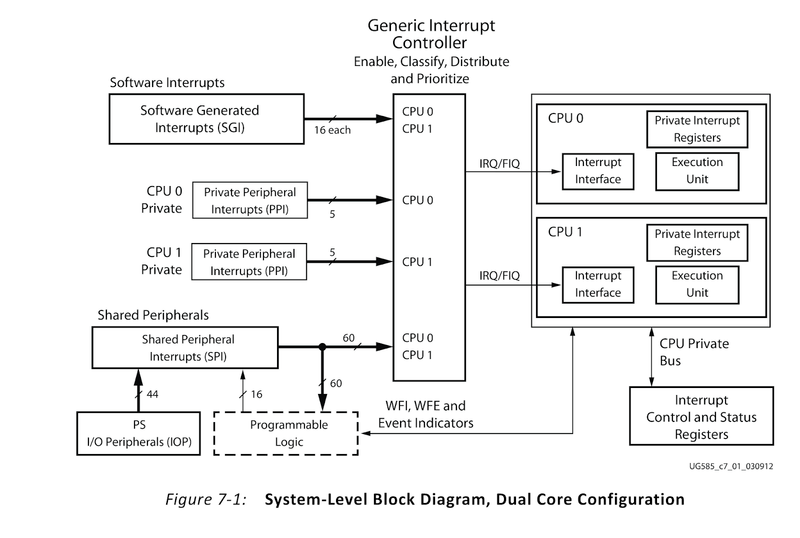 So, in effect you need to figure how to program the Generic Interrupt controller and then how to enable interrupts on the ARM processor. Luckily the Xilinx SDK provided some wrappers for shielding most of the complexity for us. 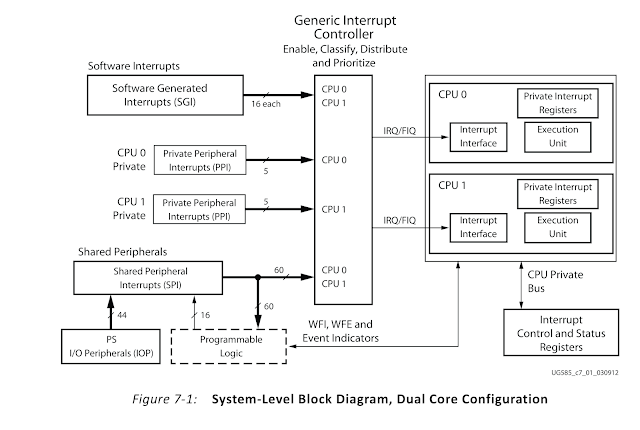 Within the method initint we basically configure the GIC and enable interrupts on the ARM processor. Also, in the code we are enabling Shared Peripheral Interrupt (SPI) #53. All USB block related interrupts will trigger via this interrupt. We also configure so that our custom method state_machine will be called each time a SPI interrupt #53 happens. We will fill the method state_machine during the course of time. You might realise that the method call XScuGic_Connect accepts a fourth parameter, which in this case we just passed a pointer to an integer called myhelp. Usually for this parameter you will pass a pointer to a driver structure and when an interrupt happens, your interrupt handler (which in this case is state_machine) will receive this pointer as a parameter. In our case we will not be using this parameter in our interrupt handler. Instead, we be implement a state machine within our interrupt handler and define a global status variable that will keep track of the current state. One final thing needs to be done with our interrupt initialisation and this is to enable the applicable USB interrupts. We would like to enable the General Purpose Timer Interrupt 0 (GP0). We also would like to enable Async Interrupts so that an interrupt is triggered when an Asynchronous transfer has completed. During our journey to create a USB interface one of the things we will often do is to schedule a timer to wait a certain amount of time before performing the next task. One can certainly use the sleep or usleep function provided by the SDK wrappers, but I am not so sure how accurate those are. For the purpose of scheding timers, I am going to make use of General purpose timer 0 provided by the USB block. This timer works in a very similar fashion as timers you find on a CIA 6526. You load a timer value into a load register, and then force this value to load into a running a timer register. The timer will count down from the predetermined value until it reaches zero and cause an interrupt. On the Zynq, the timer load value register is located at 0xe0002080. This counter clocks at 1MHz (exactly the same as the CIA on C64). This register is 24 bits wide and can thereforebe set to up to 16 seconds. I added the usleep in the main method so that our program isn't exited prematurely. After 3 seconds the message Timer finished will be displayed on the console. The write to location 0xe0002144 at the beginning of the state machine needs to done to ensure that the interrupt that just happened is cleared. Without this state_machine will be executed in an endless loop. In this post we covered some theory regarding USB. We also started to write some for disabling data caching and enabling the appropriate USB interrupts. In the next post we will implement functionality for resetting a USB device and configuration info from it in its default state.